What it is: A sulfate-free restorative shampoo that replenishes moisture, repairs damage, and protects against future breakage and color fade. Who it's for: Those with dry, damaged, and brittle hair. What it does: Infused with Briogeo’s signature blend of ultra-nourishing rosehip, argan, and coconut oils, this shampoo effectively restores silky sheen to dry, brittle and overall lackluster locks. Coconut oil penetrates the hair shaft to nourish and repair from the inside out, sealing the uplifted cuticle to lock in moisture and reduce environmental impurities. Argan oil provides extensive conditioning to restore luster and diminish frizz, while antioxidant-rich rosehip oil shields strands from UV and free-radical damage. Safe for: Color treated, keratin treated, chemically-treated, and relaxed hair. Attributes: Cruelty-free. Vegan. Gluten-free. Contains organic ingredients. 98% naturally-derived. Non-GMO. Fair Trade. Made in the USA. Formulated Without: Sulfates, parabens, phthalates, silicones, DEA, and synthetic dyes. Suggested Usage: Apply to wet hair and vigorously massage for about 30 seconds as the lather builds, then rinse. If your hair has extra buildup, rinse and repeat. 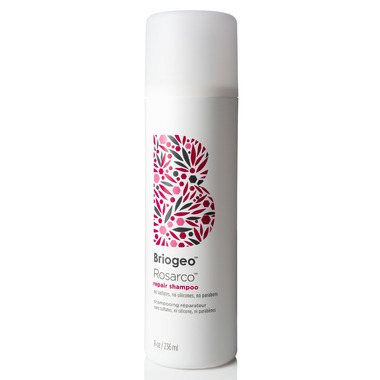 For best results, use Briogeo Rosarco Repair Conditioner after shampooing. Rosehip Oil: Antioxidant rich oil that protects the hair from UV and free-radical damage; essential fatty acids in this oil help reduce frizz and balance hair hydration. Argan Oil: Powerful nut oil rich in vitamin E and essential fatty acids to provide extensive conditioning and help combat dryness and damage and diminish frizz. Coconut Oil: Penetrates the hair shaft to seal in moisture, protecting against breakage, environmental impurities, and excess heat. Vitamin E: Softens the hair, provides essential healthy-hair nutrients, and helps prevent breakage. The fact that this shampoo is free of harmful chemicals is the reason I bought it, and the fact that it smells great, lathers awesome & leaves my hair so soft are all great bonuses! I have the Rosarco leave in spray & love it as well...great product from a great line.